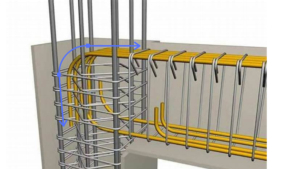 We use these terms ” Lap Length and Development Length” in Bar Bending Schedule details or drawings, and these two are extensions to the bar. The main purpose of extending bar or adding bar to the existing bar is to transfer the load safely to another bar without any loss. Lap Length & Development length are extensions of the bar which are done to transfer the load safely to another without any loss. From the factory, the length of a steel bar is 12m. If steel bar needs to be increased more than this limit of 12m? Then the two bars are overlapped to transfer the load safely. In general, Compression members are Columns, and tension members are beams. 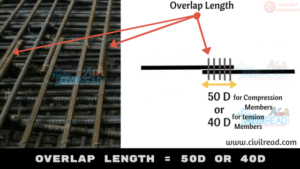 In development length, the load carrying by rebar is transferred to the surrounded concrete. Development length is also known as Anchorage Length. 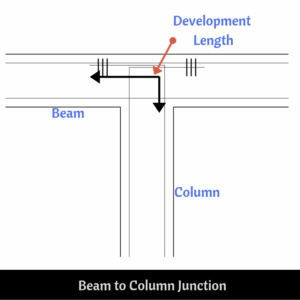 Development length is provided in Slabs, Continous beams and at column-beam joints. As per IS 456:2000, in the tension or compression member at any section shall be developed on each side of the section by providing appropriate development length. If provided, the bar won’t be slipped away from the support. It is also provided when a bar carrying certain force is removed. In such cases, it is necessary to transfer this force in the bar to the surrounding concrete over a certain length. How to calculate lap lengths?